Knight of Swords (R) says to continue to cut through the thoughts, attitudes and beliefs that are creating blocks to your movement and the expression of your creative – intuitive thinking. Allow the limitations and restrictions to be removed by releasing your desires to actively express your creative energy. See clearly the people you must steer clear of – recognize that they can upset your plans and create trouble. When you face those who are opposed to your thoughts or plans – it is not a good time to start a new project or change your lifestyle. Continue to be patient and wait a little longer before moving forward – trust that your patience will make you a winner and allow you to restructure your relationships so that they move in new directions that are unlimited and less restrained. Allow your weakness to overtake you and you will become careless and excessive – you will experience a mistaken response to a situation which calls for a quieter more careful approach. If you do not apply them, great ideas will only spin around in your mind and never manifest into your reality. Where are you charging and why so fast? What point do you feel committed to make? Who has been impatient and careless of your feelings? In the first position: The knights are born to service but you will be needed to pick up where many others have left off. In the second position: If this is a person, they may not be backing you up at this time. At one extreme, you may be overdoing it at having the latest and greatest, throwing much of the baby out with the bath water. In the third position: You are the agent through which this knight can deliver his/her gifts. In the fourth position: As with the kings, this archetype can become distorted and block rather than foster love and creativity. At one extreme, the figure is idolized and idealized and real life will find it hard to complete. At the other extreme, the figure is loathed and by extension either all youth or all of certain types of youth are not to be loved/trusted. In the fifth position: You may think adversely about this knight or he/she about you. In the sixth position: At one extreme, there may be a retreat by you or the knight. In the seventh position: There may be fear of new information, of what it may reveal in and of itself or of what it may do to your cherished picture of reality. In the eighth position: There may be a temporary block in your material affairs stemming from the mental. Also, physical matters may have adversely affected the Mental Plane. 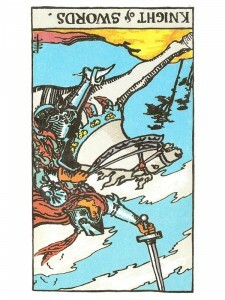 In the ninth position: Your heart may be involved with this knight but rather not be. Or, the opposite, this can be the symbol of your heart’s sadness over this person. In the tenth position: Much of this blessing will be passed through you to others.